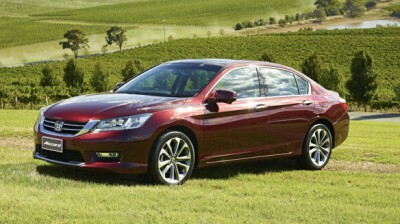 Honda’s latest Accord V6L is quite a car. It’s excellent at a lot of things, and the medium-size Japanese sedan is a class leader. No, it’s not the cheapest, however at a little over $55k it isn’t the most expensive, either. When you experience the Accord’s talent and technology you start to see why this becomes a desirable car to drive. Sleek and large can go together; at least with the elegant Honda Accord V6L it seems that way. A nice long and curvaceous roofline carries through to a nice squat rear-end, making the V6L an attractive sedan. Bold, aerodynamic headlights create a striking impression for onlookers, and the low-profile bonnet and face of the Accord V6L give the sedan plenty of presence on the road. This is a car that looks great on any drive. Touches of chrome on the exterior of the V6L sedan look classy, and the debate I have is whether the deep red or midnight blue metallic colours Iooks best – I like them both! Other very smart colours are provided. Twin chrome exhaust pipes finish off the rear of the car nicely, and a powered sunroof is standard. Under the bonnet of a new Honda Accord V6L is a six-cylinder i-VTEC engine that is silky smooth. The 3.5-litre engine is quick and punchy, while effortless in the way the power is delivered. A fast trip around some of the windier roads around Melbourne reveals the car as composed, comfortable and agile. Predictable steering and a taut chassis ensure that the driver can feel in control and satisfied with the car’s agility through tighter corners. On the straights, the Honda Accord V6L is well-planted and quiet at speed. The chassis has a MacPherson strut design at the front and a Multi-link set-up at the rear. Tuning has the Accord V6L set-up for comfort, and when the need arises to press on quickly, the chassis offers loads of satisfying grip. Stopping power is excellent, and the ventilated discs at the front, and solid discs at the rear, provide reliable and strong braking performance time-after-time. One of the noticeable delights is the beaut way the engine and six-speed automatic gearbox communicate smoothly and without hesitation. Honda’s six-speed auto boasts Grade Logic Control, and it obviously does its job perfectly. With a maximum power output of 206 kW at 6200 rpm and strong torque in the mid-to-upper rev range, when the right foot is planted there is plenty of smooth and lusty acceleration. Peak torque is 339 Nm at 4900 rpm. One of the joys of driving a new Honda is that you know that the car will be efficient. For a 3.5-litre V6, the Honda Accord V6L returns around 9.2 litres/100 km; a great effort for a large engine, and an effort that makes it one of the more frugal cars in its class. Out on the open road, the engine and transmission tuning allows for excellent fuel economy figures. Technological features on the new Honda Accord V6L are well advanced, placing the car at the top of its game. Things like auto rain-sensing wipers, hydrophilic side mirrors, LED Headlighting and taillighting, Active Cornering Lights, Cruise control, an adaptive ECON driving mode, an excellent Multi Information Display feature, a Lane Keep Assist System, a Collision Mitigation Braking System and Active Cruise Control settings are all standard items. Keeping the temperature nice and even inside the cabin is effectively done by Honda’s new i-Dual-zone climate control system. There are many more top features, and you can see these on an extensive feature list. Inside the Honda Accord V6L sedan is plenty of room. Honda always seem to come up trumps with providing the best leg and shoulder room in there class. Leather seats are spacious and comfortable for the long haul. 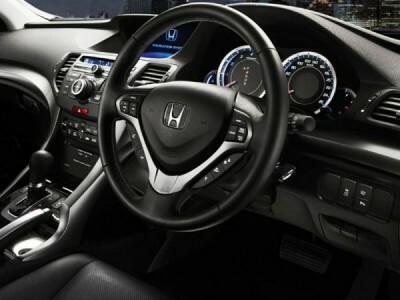 An audio system provides nice sound for playing music tracks on, and Honda also provide a telephone system for making calls while moving in traffic, with your eyes on the road, of course. No need for texting or making calls on a cell phone while travelling in the Accord V6L, as Bluetooth hands-free is standard. Satellite navigation becomes your own mobile mapping service – which also takes into account the traffic congestion on the roads, making picking your best route from A-to-B that much clearer. If you’re the driver, then you’ll appreciate that you can access your favourite music, Bluetooth, cruise control and MID controls via your steering wheel mounted controls. Safety is an area that the Honda Accord V6L excels in. Honda boasts a new Advanced Compatibility Engineering (ACE) structure that cocoons and protects occupants in the event of a major accident. Airbags with dual stage inflation for front seat occupants is standard. Curtain airbags the full length of the Accord V6L is a feature that I wish all cars had today. Honda’s Accord V6L is also keen on looking after the little ones too, with child safety seat anchorage points, and childproof rear door locks. Progressive crumple zones on the sedans bodywork are a major help in softening any large impacts. Premium side impact protection and whiplash mitigating front seats are other ways Honda ensures that the sedan’s environment remains as safe as it can be. Length for the V6L is 4885 mm, while width as 1850 mm. Inside, the space and comfortable ride is also attributed to the nice lengthy wheelbase of 2775 mm. A handy 457 litres is available in the boot for carrying luggage, and the rear seats can be folded down to create more space. Do make sure that the Honda Accord V6L is checked out, particularly if you’re looking for one of the better medium-to-large size cars on the market. You won’t be disappointed. For any more information on the Honda Accord V6L or, for that matter, any other new car, contact one of our friendly consultants on 1300 303 181. If you’d like some fleet discount pricing (yes even for private buyers! ), we can submit vehicle quote requests out to our national network of Honda dealers and come back with pricing within 24 hours. Private Fleet – car buying made easy!